Euro broke the group of upper fibo‑levels upwards and made me close my buy order and open sell one. I closed my yesterday’s buy order with almost no profit. In the near term, price may fall down towards its local targets near level of 61.8% (1.3615). If pair breaks this target area, market will fall down much deeper. As we can see at H1 chart, pair is trying to rebound from local level of 38.2% inside one of temporary fibo-zones. Probably, price may break local low during the day. Franc is moving above the group of lower fibo-levels, which means that it may start new correction, at least. 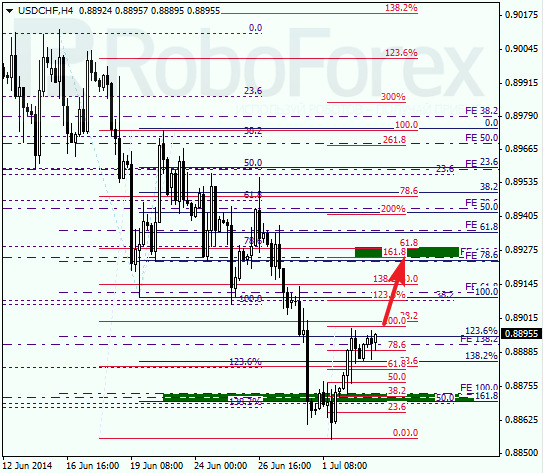 Short-term target is at level of 61.8% (0.8930 ‑ 0.8925). At H1 chart, local correction reached level of 23.6%. Right now, price is moving inside temporary fibo-zone, which means that it may reverse upwards and continue growing up. I’m staying out of the market, but may open buy orders during correction in the future.